Doofuss 17 Walkabout – Wealth Confiscation, All is Vanity, Search For The Truth, Crossing Over and a Heavenly Snare. Well, it seems that Obama’s trip to Israel may contain a few clues as to where we are on the Lord’s timeline. The White House released a map of Israel and as you can see, JERUSALEM is not a part of Israel, nor it’s capitol and never will be according to this newly released map. I wonder if they consulted the God of Israel concerning this, but something tells me they did not. So what are we being told by Obama with this release? It surely is not by accident. Nothing of such a major and contentious issue as this would ever be released without the full consent and knowledge of Obama, and the date of the release has been carefully selected to coincide with the LAND FOR PEACE SWAP. What it really tells us is what Obama said a long time ago – that Israel needs to go back to the 1967 borders and the Oslo Accords. And remember that from the time that Obama was awarded the Nobel Prize for Peace on October 9th, 2009 is exactly 1260 days to March 22nd2013. So then, the clues are pointing to the fact that the Illuminati knew back then that Obama was their man, and that he was the one who would make the COVENANT WITH MANY. Remember also that Obama confirmed a covenant with Israel to defend her back on the 9th of Av, 2012. As you know, the 9th of Av is a deadly day for Israel and bad news for all Israelis. So here we are – LAND FOR PEACE, a SWAP, if you will. Of course, we know that in spite of all of the beautiful words, Obama speaks with a forked tongue, and hates Israel, hates the Orthodox Jews, hates America, hate the Christians and is an Islamic, which is why the Islamic Brotherhood is all over the White House these days. One does not need to be a rocket scientist to see the handwriting on the wall. It is called betrayal, as old as Cain. However, Israel is really between a rock and a hard place, and Obama knows it. There is no way he will not take full advantage of it to FORCE THE PEACE, TO CONFIRM THE COVENANT BY THREAT OF WAR. The word “confirm” means to enforce by power. Obama has the power. Obama has the upper hand here. He also has Perez and others on his side concerning the 1967 war borders. 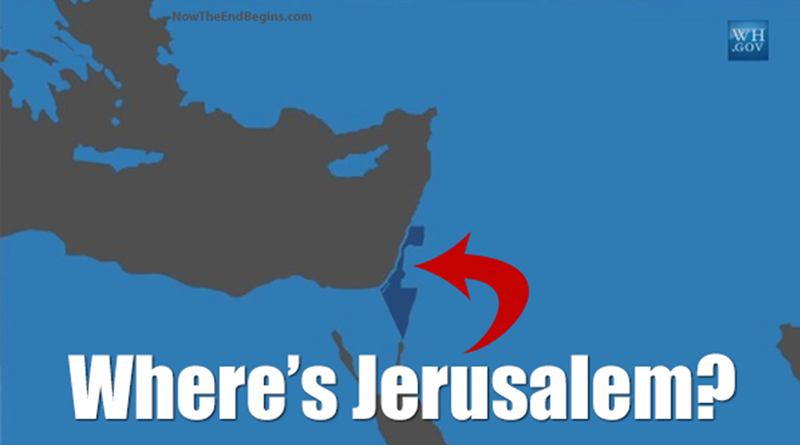 In the map, Jerusalem vanishes, is no longer part of Israel. Golon Heights vanish, no longer part of Israel, go back to Syria in all practicality. In other words, the MAP shows Israel to be very vulnerable to a MASSIVE ATTACK. All the land won fair and square by Israel in the ‘67 war vanishes. One might also want to speculate what this actually means, for when you take the 1967 war and place it against the 6000 year doctrine, with each day representing a 1000 year period, we have a perfect match. The 1967 war was allowed by God to warn the human race that the end was drawing near. Obama wants to undo what God allowed. 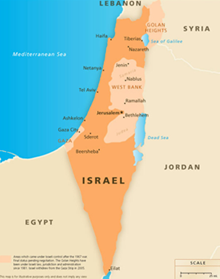 “TEL AVIV – The White House has released what it says is a map of Israel. The only problem is that Jerusalem, Judea, Samaria and the Golan Heights are missing. So it appears that it has begun. And you can bet that the world will cheer Obama on to “solve” the “Israeli” problem once and for all time. Would not the world cheer? Would this “covenant” usher in this period of a FALSE PEACE, just before SUDDEN DESTRUCTION? In one of the speeches given in Jerusalem by Obama, he used the words “security and peace”, knowing full well that if he reversed it would tip a lot of people off. If Obama is who we think he is, then he knows DARK SECRETS, AND IS A MASTER OF THE CRAFT, and causes the CRAFT TO PROSPER. Also, Netanyahu confirmed their new government and that they are ready for historical compromise with Palestine and regarding JERUSALEM. We were told by the Lord that at the time of the end that GROSS SPIRITUAL DARKNESS COVERS THE WORLD. It does. The commands of Jesus Christ to ENTER YE IN have fallen into the winds of apostasy, from Catholic to Protestant. They claim they love the Lord but REFUSE his commands, as they did in the Days our Lord walked the Earth and they said “He hath a devil”. So the REAL truth is of Satan, and the LIE is of the Lord, according to the world at large. A complete and total reversal of all things. WATCH JERUSALEM, OBAMA, THE POPE AND HANG ONTO YOUR HATS FOR WE ARE IN FOR A BUMPY RIDE. It appears we are now entering in to 1260 days of trouble. It has been an interesting time for our ministry, and it seems that one cannot even give away real hard truth anymore. While the world of apostates scream that we need a Jeremiah to bring us back to the truth, if Jeremiah were here now the same ones screaming for him would kill him post-haste – and that is the true nature of apostates – they refuse, totally refuse, all real truth and continue, even the face of severe warnings to embrace the lies rather than pick of their cross and die the death required of Jesus Christ. It is amazing to me how far our ministry has been isolated by the so-called remnant, and it is because of our TRUE salvation message. No one, and I mean NO ONE, has ever come up with an answer that is Scriptural, as to why the multitudes of Christians, many on the front lines doing miracle works, are rejected by Jesus Christ, even when the answer is right under their nose. Cruise the internet and see all of the “how to get saved” portion of many a prophetic or otherwise web sites and it is easy to show why Christ does in fact REJECT THEM OUT OF HAND. They are not part of the Bride of Christ, they only proclaim loudly that they are. They refuse the simple and blunt commands of our Lord to ENTER IN AT THE STRAIT GATE, and to WALK THE NARROW WAY UNTO DEATH, BURIAL, JUDGEMENT AND RESURRECTION. You can KNOW all the facts about prophecy, about world news, about what is going on, but if you do not KNOW JESUS CHRIST by MEETING HIM IN TRUTH, none of the rest matters, for it is all VANITY, and YOU LOST. I know this message is hated by so-called Christians of all stripes, but it does not change the reality of it. I have been preaching this message for over 25 years, and only a very few have picked up on the real truth of it. I preach the same Gospel that Jesus Christ preached Himself. I have not changed my testimony because it is the hard cold truth. Jesus warned me long ago, as He did Paul TELL THE TRUTH, I’LL WILL HANDLE the consequences. But now I know why Jeremiah was called the weeping prophet. He knew what the real truth was, and was speaking into the WINDS OF APOSTASY. These people, for all of their proclaimed love of Christ, are apostates, rebellious, and who know not the real Mystery of God. Like Paul, I wait for people to ACKNOWLEDGE THE MYSTERY OF GOD, but I get back almost pure silence. Soon I will be leaving you all. Many a time lately, late at night, as I trudge up to the house from my studio at 11 or 12 PM or after, a voice keeps saying “not much longer”. And when I do leave, via death or rapture of the Bride, I will only weep at all of those “experts” who are full of haughty so-called “knowledge”, who are arrogant and blind, and who have isolated the truth from others, and who will not proclaim the real truth, but who insist on leading their blind followers into the ditch along with them. The Age of Grace is almost over. The Door is all but shut. Many there will be that will stand without, screaming “open for us, open for us” and will hear the voice of the Lord “I know you not”. Why cannot you hear the real truth? You have ears but cannot hear. You have eyes, but you cannot see. You mock the truth all the while proclaiming you have it all wired down tight. Really? “Ever learning, but never able to come to a KNOWLEDGE OF THE TRUTH.” Did you get it? Do you understand why Paul asked such an important question, totally rejected even by most of the so-called remnant today. ACKNOWLEDGMENT OF THE MYSTERY OF GOD! Do you understand the simplicity of the Gospel? Are you able to grasp even the most elementary aspects of it while you proclaim your mastery of the Holy Book? “By their fruits”, Jesus said, “you shall know them”. What are their fruits – really? False salvation message by the thousands. Go to their websites and read it for yourself. They have fallen hook, line and sinker for the modern day Christian salvation message which is a lie. There is not only NO acknowledgment of the MYSTERY OF GOD REVEALED TO HIS TRUE SAINTS, there is a total refusal that it is even necessary, and worse, they proclaim boldly, it is Satanic to its core,!!! And now, I hear more and more, that Paul was an imposter, a liar, a deceiver, that his teachings oppose Jesus Christ. It is the height of ignorance and actual blasphemy to make such a remark as that, because when you MEET THE LORD FACE TO FACE, and you UNDERSTAND the MYSTERY OF THE GODHEAD, then, and only then, will you UNDERSTAND THAT PAUL’S STATEMENTS are identical to the Lords!! He is not an imposter. And soon, many so-called preacher boys, evangelists, prophetic scholars and what-not are going to find out the hard way that what Paul taught, and what I have taught, is TRUE. I have never changed one iota of my testimony, because it is the truth, and the truth, in the end in unassailable. So now what? The time is almost over, the warnings went unheeded and mocked, and when the door is shut, which is coming soon, what will you do? My suggestion is that people get their heads out of the sand and search after the real truth of the matter. Those that will, have a reward that is beyond anything they can imagine. Obedience to the primary commands of Jesus Christ to SEARCH HIM OUT, AND TO FIND HIM is true worship. The rest of it Jesus answers bluntly: “With their lips they honor me, but their hearts are far from me.” It says it all. Your so-called worship is fake, it means nothing, it is all VANITY, and you LOST. Now I myself am a poor excuse for a Christian. I never said otherwise. I have no idea why the Lord would have come to me in the manner He did. I am not even religious, for I KNOW that Jesus did not bring another religion, but rather was a destroyer of religions, controls and power mad clergy. He brought with Him a GIFT OF DIVINE AGAPE, A LOVE EXCHANGE, YOUR SO-CALLED LOVE FOR HIS TRUE LOVE. He came with a NEW TESTAMENT, and a way to enter in. I find it odd that one cannot even give way the real truth today, not in Earth Changes, Not in real prophecy, not in world news and where it is heading. Indeed GROSS DARKNESS COVERS THE PEOPLE. We are here folks, and I pray you will be in heaven one day, but I fear most will not be. Those that the world rejects, those that it mocks, those whom the human family claims are outcasts, whores and criminals, and those that “bring another Gospel and another Christ” – well, they may well see heaven while the so-called “experts” in the Bible will see hell instead. Odd how everything is reversed in these last of the last days. Be warned. I did as asked. I told the hard unvarnished and real nasty truth. I don’t really mind the mud thrown in my face, or being isolated by the so-called on-line pastors, preachers and teaches out there. I marvel at it, and I weep for them. I know what is coming upon them. I know what is going to come upon this world. It has begun and it cannot be stopped. So be it. As Paul said, I have run the race, and there is a crown laid up for me, the crown of eternal life. I do not deserve it. In my flesh I am wicked and evil. The depth of depravity of the human being will only be truly known by the those that have come to the light of DIVINE AGAPE and been judged guilty. I have been through my GREAT WHITE THRONE JUDGMENT. I deserve fully hellfire forever. Were it not for the love of Christ, for His mercy, for His compassion for the lost, not one soul would be saved. Do not mock Him that speaks to you from heaven. Obey Him, walk the walk; stop the talk. Pick up your cross, enter in, and die that most mysterious death and sit in the pit of hell waiting for Him that bade you to the wedding. He will come. To those already in the pit, have patience. Rest in His promises. He will come to you in due time, and He will say unto you, “Friend, come up higher”, just as He did to Erin a few weeks ago. And then, you will KNOW, you will EXPERIENCE the real truth, you will be rescued for all time from the PIT WITH NO LOBE IN IT. And then joy unspeakable as the Lord pours out the EARNEST. Only the few know it, the rest mock it. It is all true. The Bible is true from beginning to end, and only a fool will say, “There is no God”. And Jesus Christ is THE WORD, and the WORD BECAME FLESH and dwelt among us. Mock it all you want. The truth is there for anyone who wants it bad enough to drop the things of this world, and go on a journey unlike any journey ever taken. It is called the NARROW WAY. Stop the talk, walk the walk unto eternal life OR DIE IN YOUR SINS – YOUR CHOICE. With Pope Francis to be installed officially on the 19th, and with many world leaders in attendance, one wonders if we are not watching the beginnings of Great Tribulation for the world. Is Pope Francis Peter the Roman, the last Pope ever before the Great Judge closes everything down? It appears so, for he claims Italian descent, and according to the experts who examine such things in great detail, he most certainly is Petrus Romanus, the Pope who will lead the faithful through many a tribulation just before Rome is destroyed by Larry Taylor’s SMART ROCKS, you know, meteor shower hot and smart rocks that seem to have brains and only hits those the Lord wants to have done in. And the numbers of Pope Francis appear to be more than coincidental, like the number 13 all over the place. Are we being told that the final rebellion of mankind is now beginning? It appears likely to me. And that brings us a prophecy that appears to be untrue or mis-dated, for it appears to be contrary and in opposition to itself or is it? To jell this down, Pope Francis is supposed to be Peter the Roman, and Peter the Roman is to lead the faithful Catholics through many a tribulation and then Rome is to be destroyed by the SMART ROCKS. However the prophecy people in the ancient prophecies of the Zohar, which appear the same as the Malachi prophecies of the Pope, claim that 2013 is the year of the SMART ROCKS, and most likely on 3-19 to 3- 22-2013 or thereabouts as that is when many a world leader will be in Rome to attend the official ceremonies for Pope Francis. So if Rome is to be destroyed in 2013, then this Pope must somehow escape and move to Jerusalem and set up his throne there – and rule from there for about 3.5 years or so. Is it possible we are off on our timing? We will know by the end of this week. In other words, you can’t have it both ways – that is, you can’t have the New Pope guiding the flock through tribulations from Rome if Rome is to be destroyed now. Now if this does not happen this year, before September of 2013, then unless some special conclave with world leaders is set up, and the destruction occurs then, it would appear that we are 3.5 years off on our calculations, meaning we are just now entering a 1260 or 1290 period of time, and that means that the Pope, who has now been given an official seat in the UPPER ROOM where Christ had His last supper, would preside over the flock from Jerusalem, holding sway as the Ruler of the World sometime in the next few years. But is the Pope the False Prophet or the Antichrist? Is Obama the Antichrist or the False Prophet? Seems like Obama is telling us everything is OK, just trust him and see. That does make him a false prophet, because he is lying every time he moves his lips. Interesting concept that we could have things reversed. Interesting also is that Obama, the Prince of America is taking his BEAST CARS with him to Jerusalem. Are we being told something here? It may all be just speculation and nothing happens, or it may be that many a deal is made in the background that will play out in the next few months and years. Maybe Obama thinks he might catch lead poisoning or something unless he has his special tanks with him. Whatever direction all of this takes, we are clearly entering into the final period of man’s probation upon Earth. There is no question that all of these signs, subtle as they may be, are all pointing in one direction. Did you see the PRINCE OF THIS WORLD on TV in the series “THE BIBLE”? Did you notice how much, I mean in almost every detail, the PRINCE OF THIS WORLD AND OBAMA LOOK ALIKE? I happen to be watching it at the time that Satan appeared to Christ to offer Him the world. I instantly recognized that this was Obama. 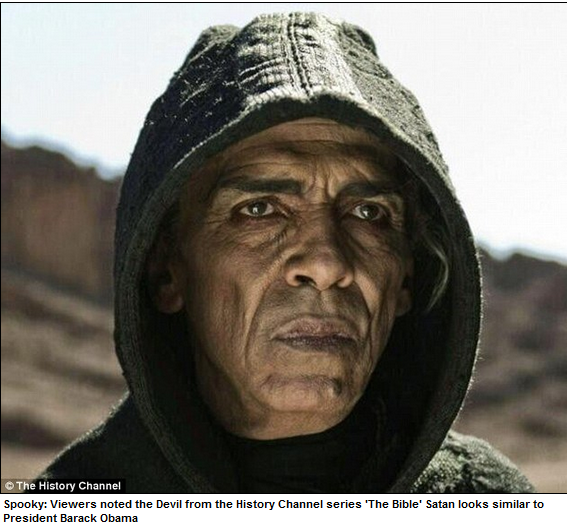 This older Obama lookalike was more than coincidental, but most likely not intentional by the movie makers – but it could well have been another SIGN FROM THE LORD AS TO WHO IS WHO, and WHAT IS WHAT. These types of signs go by most people unrecognized for what they were and are as they sail by the world unnoticed. Perhaps that is why the Lord tells us His return is like a snare, and only those really watching see the snare being laid down and have a knowing that the time is near indeed. Now that sounds like volcanic activity and a meteor shower combined. But if this is true, then the Pope, if he is the false prophet or antichrist, must somehow escape all of it or the prophecy is yet for a future time, while other world leaders are destroyed. Now the Malachi prophecy says the end is the same, but implies the last Pope does in fact lead the flock THROUGH a period of tribulation – so if Rome is to be destroyed NOW, THAT MEANS THE PAPACY MUST MOVE TO JERUSALEM or somewhere else, or the year given is incorrect and could be about 3.5 years off as to the actual date of Rome’s destruction. Having said that, many other prophecies indicate 2012 as the end. It is my own opinion that 2013 is actually 2012, and that is why we are seeing these things happening now in 2013 that were to occur in 2012. We are a year off – and that means that 2013 is not a good year for the world. Also of interest in the vision of the man who was taken to heaven when he was 15 years old, and was told he would remember it all when he was 44-45. He claims that the Lord told him that some “event”, which he did not know what it was, was going to occur before June 2013 that would change the Western world FOREVER. It was to be a SUDDEN DESTRUCTION, a SNARE, total unsuspected; that comes out of the blue. Now let’s take that concept and move it over to the destruction of Rome in a few days. . There are 14 volcanoes right next to Rome. Etna and others are showing increasing signs of instability. If Rome were to be suddenly destroyed in a “sudden destruction” THAT WIPED OUT A GOOD SHARE OF THE WESTERN WORLD’S LEADERS, the entire western world would be changed OVERNIGHT. And we have seen a massive increase in meteor sightings. Will anything happen within the next few days? Time always does tell, and so we wait, and we watch. Remember PASSOVER, UNLEAVENED BREAD AND “FIRSTFRUITS” and the possibility of a rapture of the TRUE BRIDE just as this thing begins. Heads up, folks!!! “As if there weren’t already enough signs in the Heavens, Comet Pan-Starrs will be passing over Israel with the arrival of Barack Obama in this Year of the Comet. Remember the name PAN and the comet is his STAR. Pan of course is another name for Satan. Interesting, don’t you think? Comments are welcome. By the way, don’t forget to get you ONE PENNY FutureScape III – a penny for my thoughts on the future – maybe they aren’t even worth a penny? Taxes, fraud, Pope Francis, drones and more. BRAND NEW FUTURESCAPE III – 2013 WHAT DOES IT HOLD FOR US? SO IMPORTANT ITS FREE TO EVERYONE AS A PDF. We have just finished our FutureScape III – 2013, What Does It Hold For Us? and we felt it was so important that it should be free of charge. It is a 40 page document that contains very valuable information about what we can expect in 2013 and beyond. It contains what we project will happen in EARTH CHANGES, SOLAR CHANGES, POLITICS, POLICE STATE, PEACE AND SECURITY, THE MARK OF THE BEAST, UFO’S AND THE ARRIVAL, and much more. It has taken a long time to put this together, and we felt is was just to important not to release it as a free issue. If you wish your FREE COPY PDF, go to our website http://www.thelightgate.com and click on the Paypal BUY NOW button to register and give us your e-mail address. We will send your PDF copy as soon as we are able, time depending upon numbers who want it. If you appreciated the information, please donate something to help out. Please also post this information far and wide. Have had notification that link does not always work on Paypal – if it does not, e-mail at enigma@truinsight.com or call us a 1-800-257-2672. Will post on the website as well. Well, folks, it’s all coming together rather fast now. 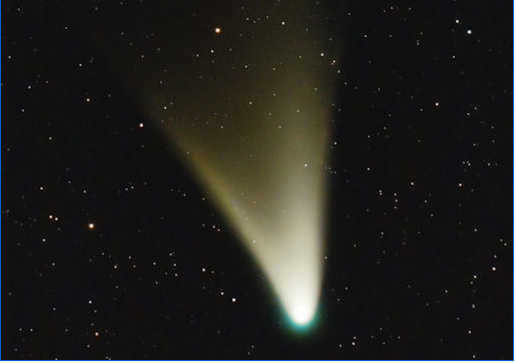 From Comet PAN-STARRS to ISON to another comet that might hit Mars, makes one wonder if the Creator is attempting in some fashion to alert the human race that their probation might be coming to a close!! I wonder, do you suppose it’s possible? The one to watch right now is PAN-STARRS as it no doubt represents the rising of Lucifer, you know, Pan’s Star, the Pagan God Pan, the goat/werewolf type – right on time with Obama’s visit to Jerusalem, his backing down on Iran’s nuke program and his slow but steady betrayal of Israel. We will be able to see PAN STARRS right next to the CRESCENT MOON in the evening, right after sunset they say, in the next few days – visible to the naked eye, that is, if you’re not vision impaired because you are not watching. Seems odd that Lucifer’s Comet is right beside the Islamic Crescent moon, but that is just a coincidence I am sure – like the almost same symbolic sign in the heavens when the Branch Davidians were burned at the stake, as it were. I’m sure most of this means something, but what ain’t exactly clear yet, as the saying goes. And then we have this comet that makes a very close approach to Mars in 2014 – it might be, just might be, what Gordon Michael Scallion was talking about – how something knocked Phoebus out of its orbit, sending it toward Earth – now that would be a sight to see, don’t you think – or would you not like to be here to watch it? 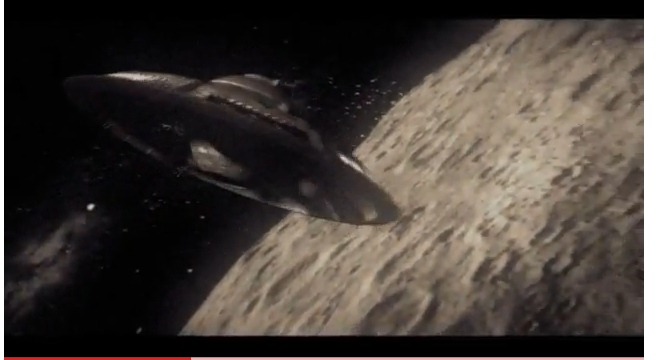 And then we have the movie IRON SKY, the Fourth Reich flying saucer attack on Earth in 2018. The movie of course was a joke, with Sarah Palin as the President of the USA then. It was a disappointment because they took a very real situation and made a mockery of it. How can I claim a real situation? Because Von Braun told Carol Rosin that Germany had operational UFO’s and anti-gravity ships back in 1944! He also told her that the LAST CARD the Military Industrial complex was going to play was the ALIEN CARD, and the implication of that was a real but very fake ALIEN INVASION. Then we had some CIA guys come out years later and claimed the same thing. Then scientist Stan Deyo released a most interesting DVD about these ships operating out of Antarctica, I believe. He ought to know, he worked for Ed Teller. But of course, all of that is just “stories”. So IRON SKY was a disinformation movie, but the graphic were real good, and the ships all looked like the blueprints I have here for what the German High Command was working on, and remember they have had OVER 50 YEARS TO “TWEEK” THIS TECHNOLOGY. Not to say just how far they have come in “clones” and “robotics” to make things appear real that are not – and then of course we have PROJECT BLUE BEAM and holographic projection tom foolery as well. Now let’s say that the insider tales of MOON AND MARS OPERATIONS and FACILITIES are true. And let’s say that ALTERNATIVE THREE is actually real and then we add into the mix how knowledge and technology develop faster and faster and how the WIZARD OF OZ CAN REALLY PRODUCE SOME REAL FAKE ILLUSIONS, now, can’t he? I mean, how many UFO’s and Mother Ships could one build over a span of over 50 years on the Dark Side of the Moon and Mars bases? Do you think it is possible, boys and girls, as Doofuss Dingle might say? And do you think these rulers of the Earth are capable of lying to us? You might want to consider that one!! Project Blue Beam was an interesting project handed to us by a fellow who the elite obviously murdered. And then we have others who have all died for revealing stuff they were not supposed to reveal and ended up dead. Now why would you kill all of these fellows if there was nothing to what they were trying to warn us about? They would simply call them “nut-jobs” and that would be that – except some of these folks had information behind them – like ALTERNATIVE THREE and then there is PROJECT REDSUN. The FALLEN ANGEL ALIENS began to set all of this up way back in Genesis, all for our benefit of course. The Lord calls it the STRONG DELUSION and warns us how “effectual” it will be in damning most of the human race who embrace the lie and mock the truth. How close is ALIENAGEDDON? Not far off, I hate to tell you, as Comet Ison is winding its way through the Solar System and that rogue scientist James McCanney is telling that this is a huge comet and a great danger to all of us. Is NASA telling us the truth or is McCanny? Could Ison be the long waited DESTROYER? Interesting question, no doubt, as the timing of Ison for November through December is most interesting. If this comet does what they say it will do, it will be 15 times brighter than the moon, and the tail will go from horizon to horizon – but of course, no one knows for sure. 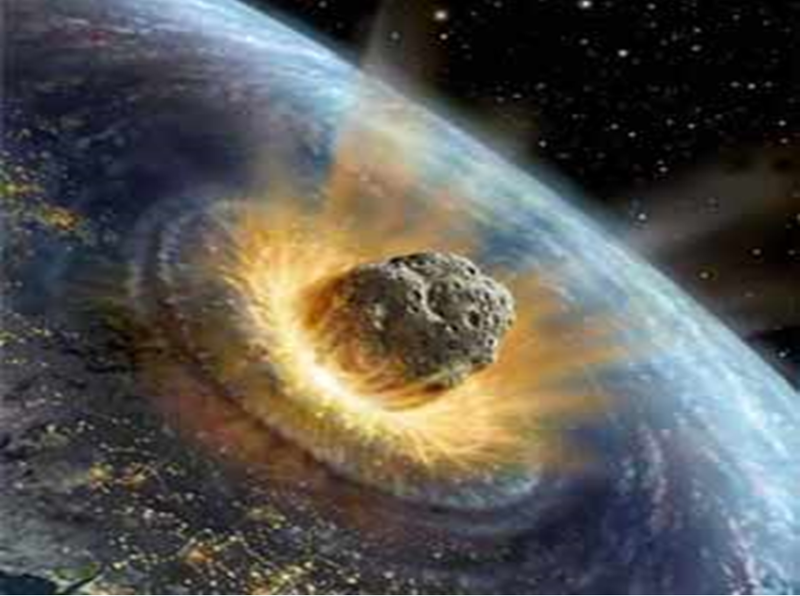 One thing is for sure – Ison is a direct warning from the SON OF GOD. “I” “Son”. Seems awful close to “I am”. When you couple Ison with Comet LOVEJOY, no one can say that we have not been warned, now can they? The question is, could this be the Comet of Mother Shipton? Of Nostradamus? The GREAT COMET? Mother Shipton claimed that its orbit would be changed, and it would fly by the Earth a number of times, causing huge upheavals. Heralding the final ending of the human race? If we follow Israel’s timeline to its ultimate conclusion, we find that Ison’s approach in 2013 is right on time. Just how all of this works out we do not know. As Sorcha Faal would say, “it is not to our knowing”. There is little question that we have in fact been backward engineering so-called “alien technology” that the Fallen Angels have given to the elite of the world. Posing as “extraterrestrials”, just as the Bible said they would, they have given the world of the Rich Men unheard of perverted and hidden knowledge far beyond anything revealed to date. That all began a long time before Roswell, of course. And do not forget that the Bible tells us that these RICH MEN make their nests in the stars, say like Mars, the Moon and suchlike. How could they of they did not have that technology already? Ever thought of that? Now you take all of this and marry it to fallen mankind’s quest for secret knowledge and ever expanding use of military weapons of total destruction to become KING OF THE HILL; you get the picture. “The kids have found the matches, and now they know how to light them”. Indeed, it is a shame the world has not figured out they are not only fallen, but will soon self-destruct. And all of that leads to Popeageddon. It is interesting that Peter the Roman is to be the last Pope, which in and of itself, another warning sign. It all ties together with the timelines of the nation of Israel, and the last 120 years of mankind’s probation on Earth, and the Papacy’s looking forward to the “arrival”. Interesting that in 1897 Israel began as a concept, moved to a reality and each and every major event with Israel falls on KEY YEARS and UFO FLAPS AROUND THE WORLD. Also of interest is that in 1897 a UFO CRASH happened in Texas on the 33rd parallel. Just a coincidence, I suppose. Remember that the Fallen Ones landed on Mt. Harmon, in Israel also on the 33rd parallel. And then I suppose the Roswell crash in 1947 (The year of the UN Mandate to divide Palestine), was also on the 33rd parallel!! Could it be the Lord is telling us that the number 33.33 is a magic number that the occult loves so much? Why are all of these UFO incidences that forge a FOUNDATION FOR THE LIE always located on the 33rd parallel? One might want to think about that one for awhile. Now getting back to the Popeageddon. According to prophecy he will lead Rome through a period of intense persecution. From whom? Could it be LUCIFER? But then, why would Lucifer attack himself, as Malachi Martin claimed there was ceremony years ago to install one nefarious Satanic BRIGHT AND MORNING STAR onto the papal chair!! You know, like a FALSE PROPHET or something like that. Perhaps part of this destruction actually comes from the Lord Himself – as the prophecy does say many world leaders will travel to Rome and be destroyed, as Larry Taylor says, by SMART ROCKS. You know those bright shining stones that come down from the heavens. Great Balls O’fire!! Seems odd that lightning from the heavens had to be used to name the new Pope as well, being that lightning is a sign of SATAN. Remember the Lord said He saw Satan fall from heaven as lightning. So then, was the Lord warning us that Satan is now going to be established as the WORLD RULER? Or that an arrival is close at hand? Remember also that Jesus said His return would be as LIGHTNING. Just remember one thing: If your feet are firmly planted on Earth and some dude comes along, no matter how pretty and pleasant and miracle working he may be, HE AIN’T THE LORD, HE IS AN IMPOSTER, and run as fast as you can away from him. Got it? Don’t forget it either. And that leads us to Barack H. Obama whose name translated means LIGHTNING. How special, as Church Lady would say – I wonder if there is any connection between Rome, Obama, Israel, the arrival, Iron Sky and the time of the end? Or the Skull and Bones number 322, you know, like March 22, 2013. Is there a secret hidden away somewhere for Obama to be in Israel on 3-22-2013? Do you think something very nefarious could be going on behind the scenes? Like hidden away, not known? Do you think so, boys and girls? Is it possible? Could we have some sort of a false flag operation, say like a small nuclear attack by North Korea just to set off WWIII? Hope not, but then again, it could be. People need to really pay very close attention to what U.S. Attorney General Holder REALLY SAID when he answered Rand Paul’s question. It ain’t what you think, as the saying goes!!! Another warning of bad times approaching? Putin Warns Amerika of World War. Russian planes probing American defenses and naval ships. North Korea warns of pre-emptive EMP strike. Unrest in Israel, Iran forges ahead with their nuclear programs; snubs nose at world. Bibi of Israel warns red line close. Obama says will attack Iran if need be. World War Three in the offering? Watch for Isaiah 17 conflict in 2013. Pope resigns and last Pope to be selected begins, Peter the Roman, already named by the Lord as lightning struck St. Peter’s Basilica in Rome. Earth going through space debris area, will increase with more and more sightings of fireballs in the skies – great balls o’ fire!! The destroyer is approaching, government silent but preparing in secret. Huge underground cities for the elite now ready. Totally stocked with food and medical supplies for years. The elite will mostly perish in those areas. China still building huge empty cities far inland on high ground and away from the coastal regions. Earthquakes and volcanic activity increasing, Can we say MAGMA RISING? Wild weather all over the globe. Cycle 24 Twin Peaks – Sun expanding? Sun pumping huge amounts of energy into Earth’s core, causing expansion. Rifts and sink holes increasing the world over as Earth expands. Light spectrum now changing? Will sun blink out per Roman Catholic prophecy of 3 days of darkness? Mini nova between 2014 -2019? Remote viewer Ed Dames’s Kill Shot 2013? Drought around the world increasing, crops failing, stealth famine, economic turmoil, monetary wars, hyperinflation on the way; civil unrest growing. Governments preparing for war against their own people – United Nations gaining power through Agenda 21 covertly. USA government claims OK to kill Americans on our own soil if Obama decides they are enemies of the state – not only legal, but moral and ethical. Everything UPSIDE DOWN. Governments will be grabbing more and more power and become totally lawless. Constitution and Bill of Rights vanish as de-facto Martial Law already going into effect. This is the transition of America into the Fourth Reich we warned about in BABYLON RISING, written back in 1988. It is now here. Total insanity in Washington; only going to increase. All agencies involved in massive sell-out as ANTICHRIST gathers power unto himself. No one dares to challenge. He is rising, and it is right here in America, Lucifer, the KING of Babylon. Isaiah 13,14, 47 tells the story. Prophecy happening right under the noses of the American people and the world at large and they are clueless on Planet Earth. UFO sightings increasing rapidly; secret space fleet being revealed, and advanced weapons soon to be shown to the world. UFO flaps always occur whenever Israel is due for prophetic fulfillment. Watch the skies for fake arrival and the end game of the STRONG DELUSION. Remember God is behind the strong delusion and it will work on the vast majority of the world as they have rejected the concept of a Messiah, a Redeemer, and Salvation. The movie IRON SKY just released was a serious disappointment because they mocked what is very real according to Dr. Von Braun, for he claimed the Fourth Reich did indeed have anti-gravity craft and would stage a fake invasion. New World currency now ready to be offered after collapse of all national currencies, concurrent with MARK OF THE BEAST technology? As we move closer to the actual Mark, we are finding out more and more behind the technology required for it, and some insiders claim it is already made with billions of chips just waiting for the right environment to introduce it. 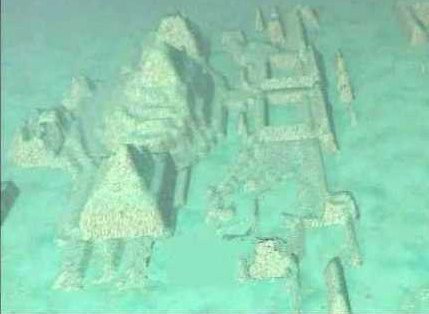 More and more of Earth’s ancient history now showing up, with major structures being discovered under the oceans of the world. Huge pyramids like city structures. Nothing will be hidden as the Lord reveals the real truth behind Planet Earth and why this is the final battle between the Lord and Satan for the souls of mankind.